*UPDATE* If you are experiencing a problem with GrabIt search please update to the latest version of GrabIt which can be downloaded from the members area. If you are receiving the following error in GrabIt please follow these steps to correct it. “Our apologizes but we were unable to confirm if you have complimentary access to the GrabIt search via Fast Usenet. Please try again later and if it still doesn’t work please contact Fast Usenet to verify your accounts settings”. The error is usually generated when multiple accounts have been created with Fast Usenet and changed in the server settings for GrabIt. By just changing the server settings the search settings aren't automatically changed. This fix requires editing your Windows system registry. Always make a backup of the registry before making changes. Please note that Fast Usenet isn’t responsible for any damages associated with incorrectly altering your registry file. If you are uncomfortable with editing the registry system then you can alternatively remove GrabIt and reinstall a new copy. You can get the latest version of GrabIt – Fast Usenet Edition from the members area. 1. 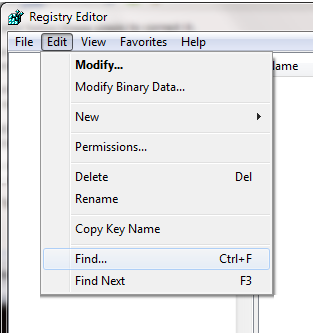 Open the Windows registry editor by clicking on “Start” and typing regedit in the search box. 4. Double click on the registry key and change the “value data” to your Fast Usenet password. Now click OK.
5. Now follow the same steps by clicking on Edit and Find. Search for SearchItUsername. Double click on the registry key and verify your username is set correctly. It it’s wrong enter the correct username and click ok.
6. Close out of the Registry Editor. The search function in GrabIt should now be working. If these steps didn’t resolve your problem or if you have any further questions please contact us.